Swipe Card Reader is a hardware device that is used for reading the encoded information of various swipe cards. Swipe Card Manufacturers incorporate a magnetic stripe in the card that holds unique information in an encoded format, which can only be read by a card reader. 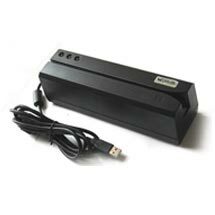 We are one of the reliable Manufacturers, Exporters and Suppliers of Magnetic Swipe Card Readers, placed in Delhi. These equipment are made under expert supervision, with the use of the best raw materials and latest techniques. They can be used for reading different cards like magnetic, gift, loyalty, credit cards, etc. Having robust warehousing facilities, we make available bulk quantities of these Swipe Card Readers at very competitive rates. Our delivery networks are widespread and allow us to manage the demand of this product from world over. Moreover, it is ensured by our team that your consignments are delivered at your doorstep in a safe and timely manner.